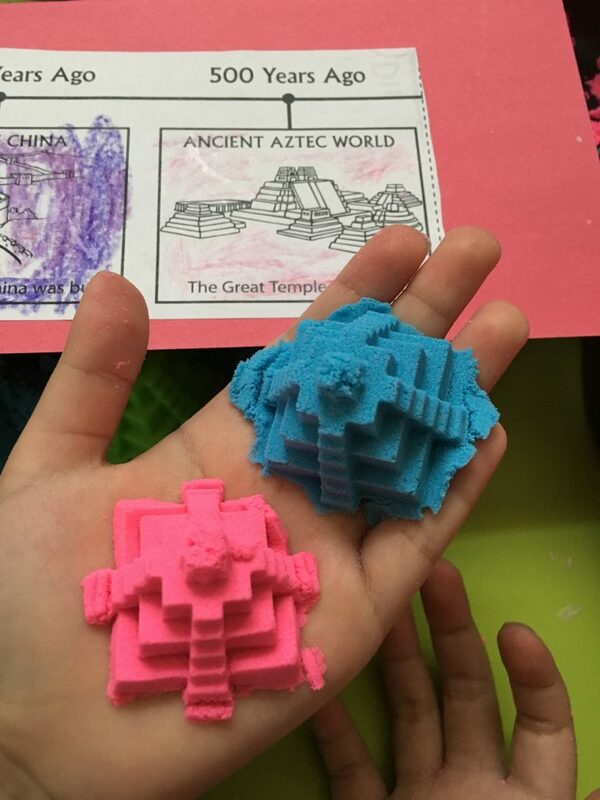 Our social studies focus in our homeschool this year is ancient civilizations. Personally, as a student, history was not the top of my favorite subject list. So, finding engaging history lesson activities for kids is something I’m on the hunt for, not just for my kids, but for myself as well. 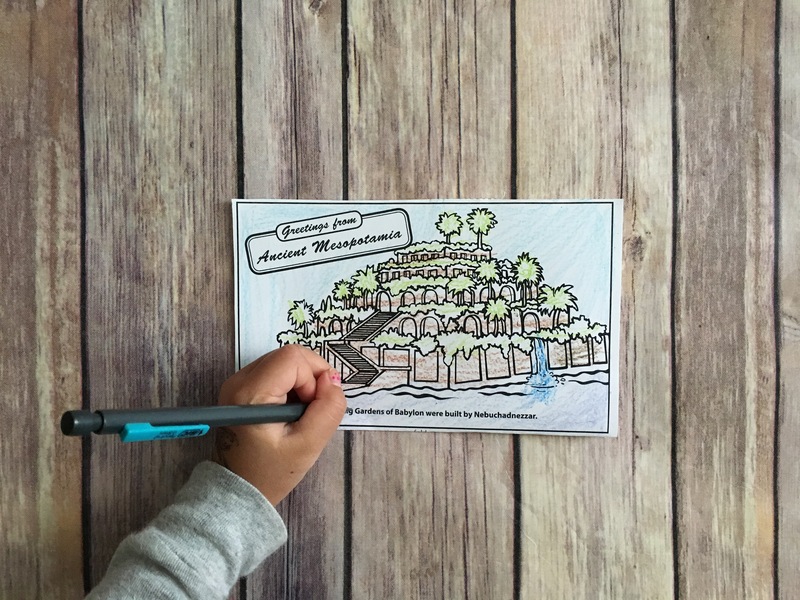 It is a 96-page workbook filled with lots of projects and activities to teach about six ancient civilizations. There is also a pocket to introduce what history is, which is vital to understanding the origin and development of our civilizations over a period of time. 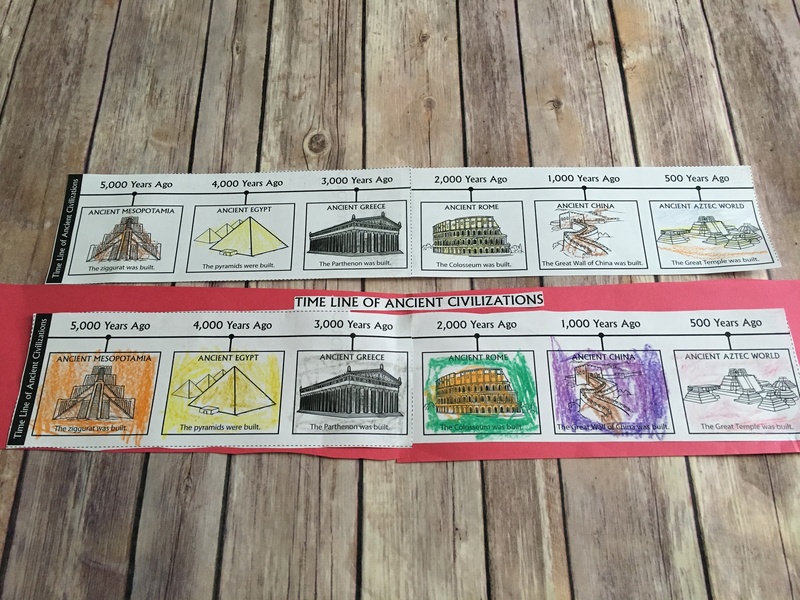 History Pockets includes an activity at the start to discuss a timeline in terms that kids would understand. Children are asked to think about yesterday, today, and tomorrow. Then we discuss things that happened in their lives last year, this year, and what we hope for next year. It led up to discussing the past, present, and future. This helped to give children a bigger picture of a timeline prior to guiding them to thousands of years ago during the ancient civilization era. 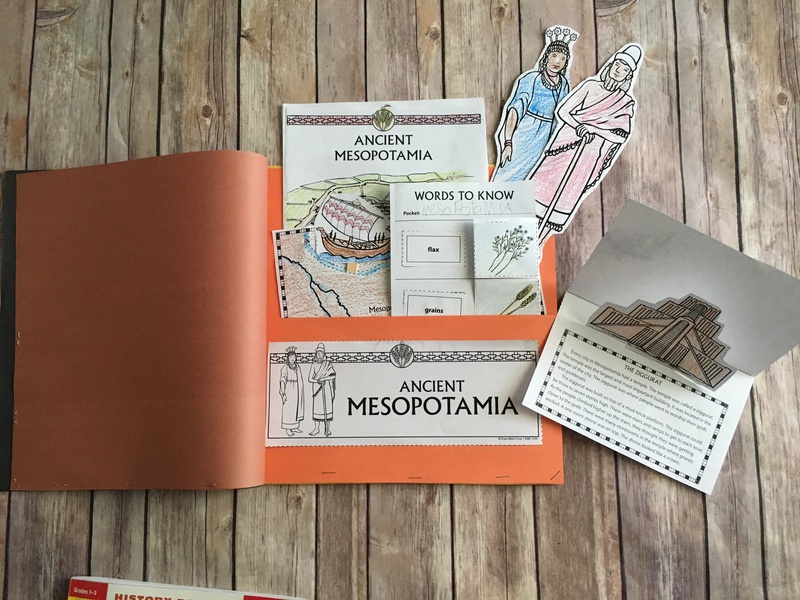 So, Evan Moor’s History Pockets does a fine job making sure to include an activity that is more relatable to the children’s sense of time first prior to jumping into ancient history. This book is good as an introduction to ancient civilizations or it can be used alongside other educational resources and history curriculum. It is suitable for grades 1 through 3 and includes hands-on projects. 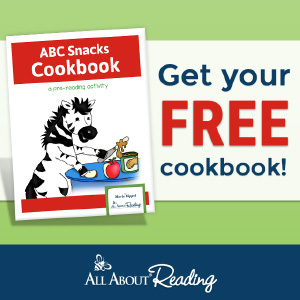 The workbook includes directions to set up a History “pocket book.” The pocket book is assembled with 12″ x 18″ construction paper, folded and bound into a 12″ x 12″ booklet. 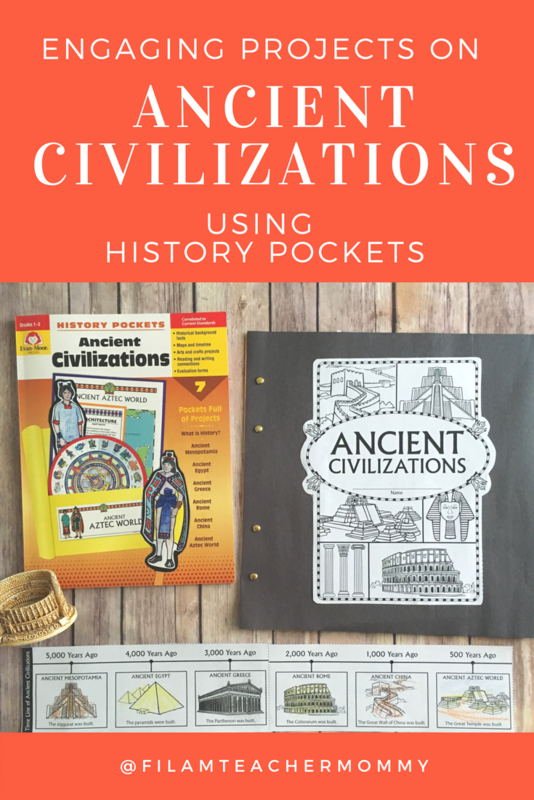 Each page has a pocket dedicated for each of the ancient civilizations. The workbook is full of reproducibles to photocopy for each student. There are clear directions for assembly and lesson introduction. 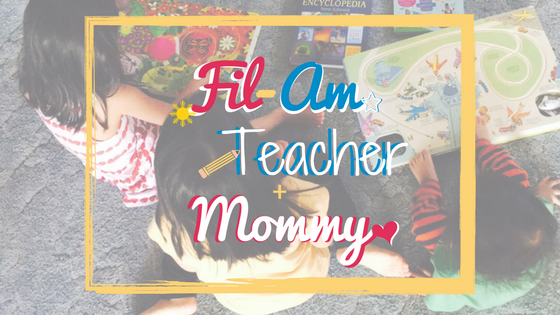 An overview page that gives the teacher or parent a summary of the activities for that pocket. A pocket label and key vocabulary words for the students to learn. These will be photocopied to include in the pocket. A teacher fact sheet to give background information on the civilization. This helps to set up the lesson for the teacher or parent. A student booklet to be reproduced, stapled, and read with the students. It is suggested to add construction paper to the back of each page for extra durability. Additional pages of activities to complete and store in each history pocket. We like that it has a wide variety of activities. It is not solely reading a history textbook followed by answering comprehension questions or taking a quiz or exam testing to test one’s memory of the facts. In the end, there is an evaluation project to bring it all together and the students will create a passport to the ancient civilizations. What an enjoyable way to show their overall understanding through something they use in real life, a passport. Definitely much more engaging than a cumulative exam. They get a general sense of a timeline: past, present, and future. They see how long ago the ancient civilizations were established. They learn the geography of Mesopotamia, Egypt, China, Rome, Greece, and the Aztec Empire. They learn what makes a “civilization” and how each developed through history. They learn commonalities and differences among civilizations. It teaches culture and the impact on surrounding and future societies. 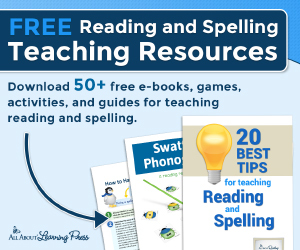 Kids work on reading comprehension, writing skills, and building their vocabulary. 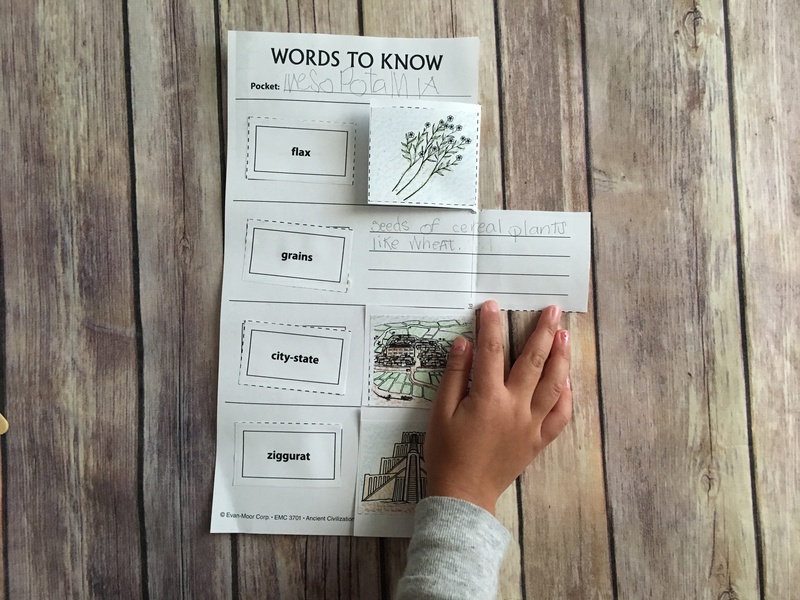 (Below is a sample of the “Words to Know” activity included in each pocket. Students learn key words from each civilization). 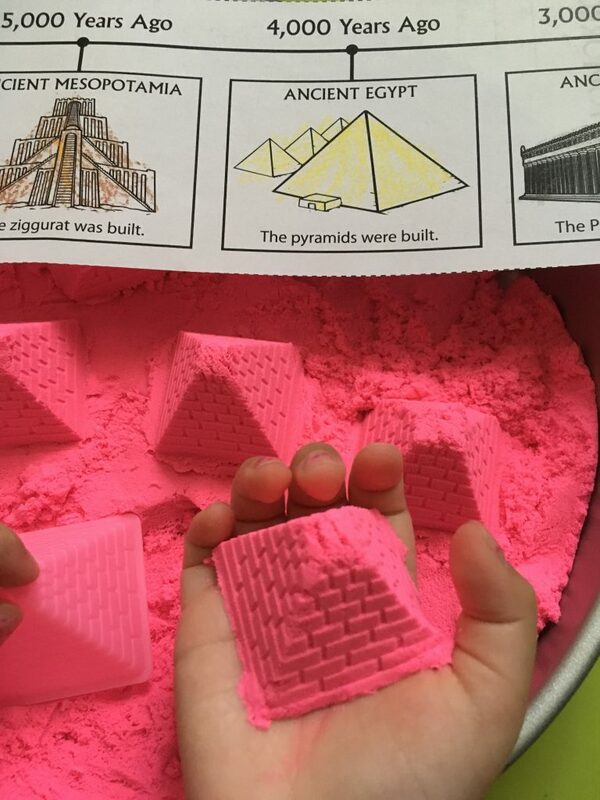 For additional sensory fun, we used kinetic sand to build some of the structures from each of the civilizations. 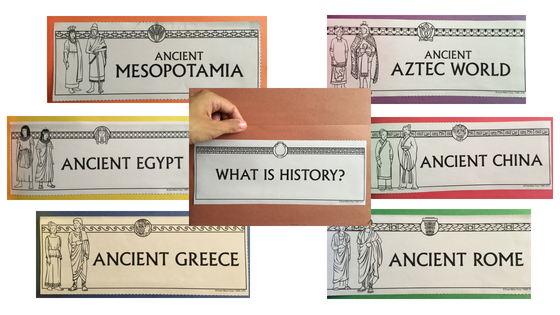 Overall, Evan Moor’s History Pockets: Ancient Civilizations, for Grades 1-3 is a wonderful resource to use in both classrooms and homeschool. 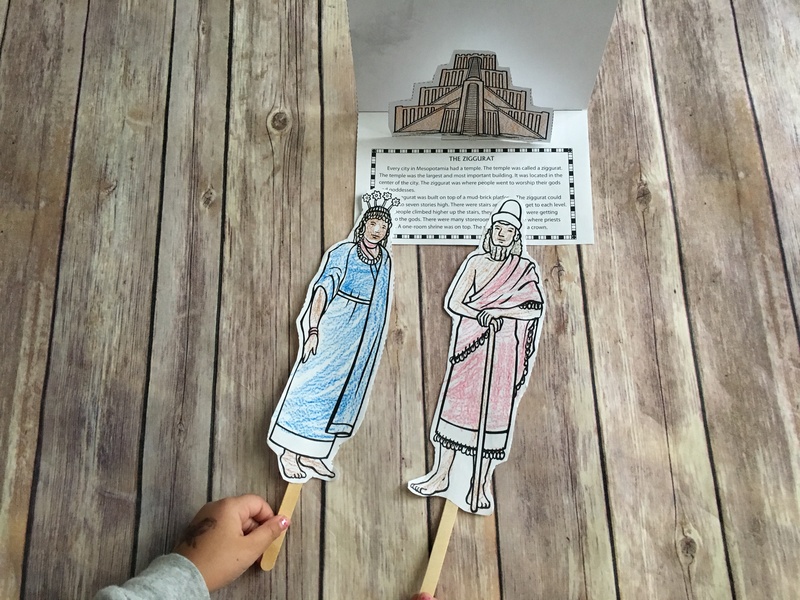 It is versatile to use as a stand-alone resource to give an overview of ancient civilizations in primary grades or it can be used to supplement another history curriculum. For your convenience, it is available in two formats: as a softcover workbook to photocopy or as an e-book to view digitally and print. 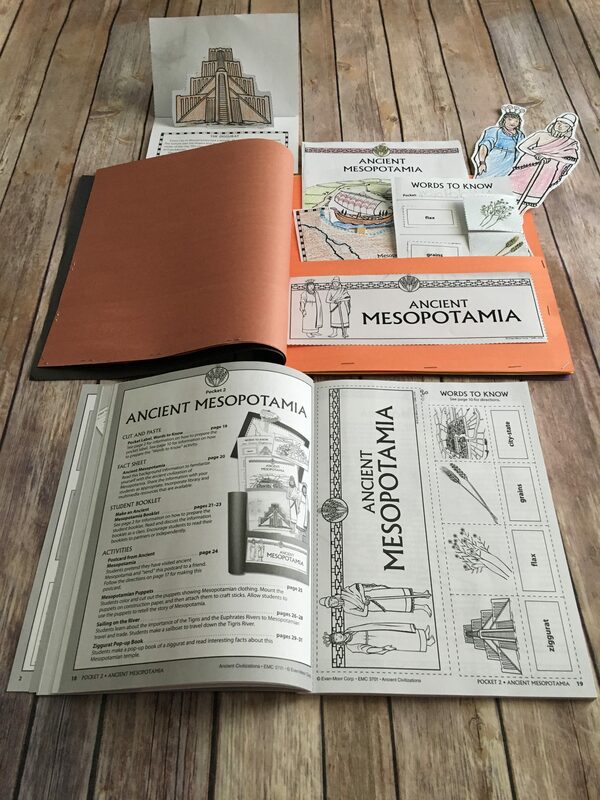 So teachers and homeschoolers, History Pockets: Ancient Civilizations, for Grades 1-3 isdefinitely a must-have resource to include in your lesson plans. 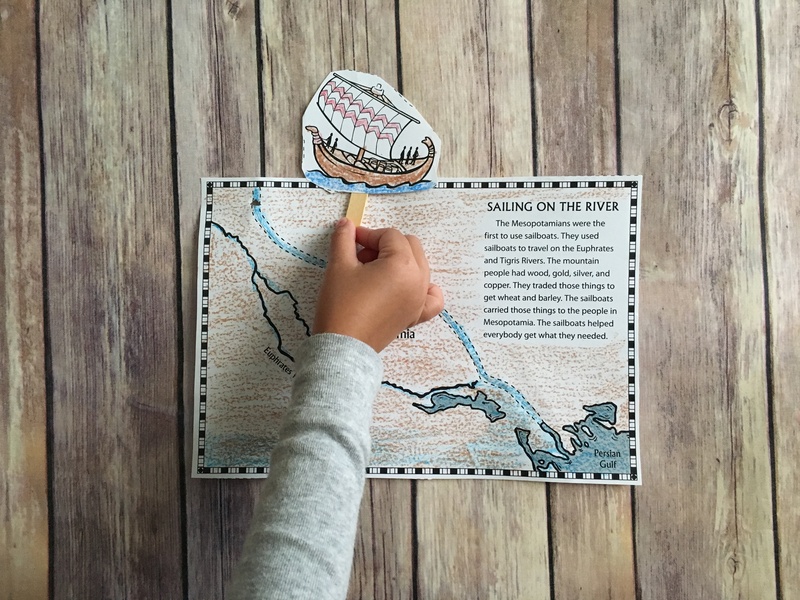 It has just the right amount of historical background for your primary grade learner and a wide array of projects to keep them interested and engaged in the topic.